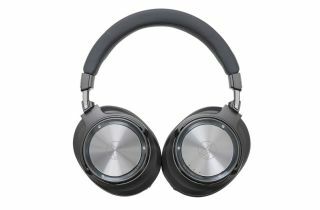 Audio-Technica launches flagship ATH-DSR9BT wireless headphones with aptX HD | What Hi-Fi? We expect to see plenty of new headphones at CES 2017, and first out of the traps is Audio-Technica with three new flagship models featuring the company's Pure Digital Drive system. So what is Pure Digital Drive you ask? Audio-Technica describes it as "a proprietary technology that, along with advancements in driver design, keeps the original audio signal completely digital from source to driver". According to the company, Pure Digital Drive produces an "unprecedented sound performance". We'll reserve judgement on that bold claim until we've tested them, but in the meantime, the Audio-Technica ATH-DSR9BT model (£500, above and below) is Bluetooth aptX HD-enabled and uses a specially designed Trigence Semiconductor Dnote chipset to keep the audio signal completely digital from from the source to the headphone's drivers. The 4.5cm True Motion drivers feature a four-core voice coil (it's single core on the £300 ATH-DSR7BT model). Both models support wireless aptX HD, aptX, AAC and SBC codecs up to 24-bit/48kHz audio in Bluetooth mode, and can also handle hi-res 24-bit/96kHz audio playback from compatible devices such as a PC via a USB connection. Near Field Communication (NFC) pairing is standard on both. A dual-layer aluminium isolation structure has also been specially developed for the Audio-Technica ATH-DSR7BT headphones. Separating the electrical and acoustic spaces will "reduce unwanted vibration that can taint the sound quality", the company says. Each model gets memory foam earpads for added comfort, and touch controls for music playback, pause, volume and answering phone calls. Three lights on the housing indicate whether the headphones are paired with a device, which code is in use and battery life status. MORE: AptX HD: What is it? And how can you get it? The third new model in Audio-Technica's 2017 headphone line-up, also making its debut at CES 2017, is the £465 wired ATH-SR9 for hi-res listening on-the-go. The SR9s incorporate a 4.5cm 'True Motion Hi-Res Audio' driver, Midpoint Mount Technology and a diaphragm coated with diamond-like carbon (DLC). The Audio-Technica ATH-SR9 is supplied with a dual-sided detachable cable incorporating A2DC connectors for "enhanced left and right channel separation and reduced crosstalk".